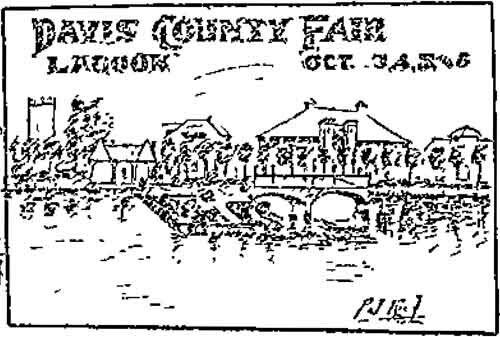 Part of an advertisement for the 1906 Davis County Fair at Lagoon from the Davis County Clipper. In the days before big box retailers and internet shopping, state and county fairs were prime opportunities for exhibiting locally-produced goods to nearby areas, aside from being major community events. 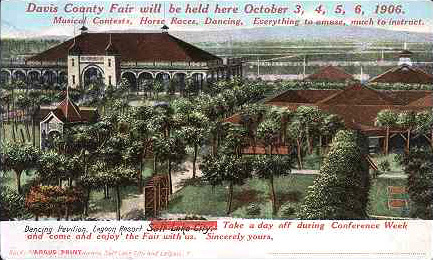 After the success of that first fair, a Davis County Clipper article stated, “The Lagoon is an ideal place for holding a fair as there are so many suitable buildings and outdoor attractions.” However, it seems the fair was not initially intended to be an annual event at that point in time. The next fair was two years later when Davis County joined Box Elder, Morgan and Weber counties in the Big Four County Fair. The combined fair was hosted at the Ogden fairgrounds for a number of years as it grew to include counties in neighboring states as well. 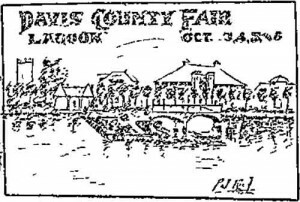 Davis County had an ongoing tradition known as Farm Bureau Day which was essentially a one day fair at Lagoon. Around the mid-1920s there was talk of expanding the celebration into a full-fledged, annual fair. Governor George H. Dern spoke at the festivities in 1926 urging the county to do just that. It wasn’t until 1929 that the Davis County Fair became a regular occurrence and Lagoon was home to the fair until World War II. In 1942, exhibits were dropped and the two-day fair reverted back to a single day. Lagoon remained closed for two or three seasons during the war and it seems there was a chance of it being closed for good. Land was purchased east of Davis High School in Kaysville as a permanent site for the county fair where school buildings such as the fieldhouse were also put to use. 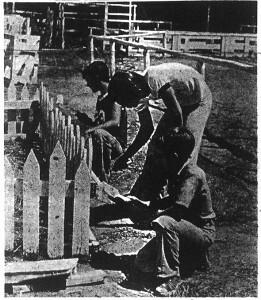 When county fairs were first held on the Kaysville site in the 1940s, fair officials hoped to expand in that location, but surrounding plots of land later became unavailable. Residents of the homes being built around the perimeter of the fairgrounds complained of dust and noise from the fair. By the ’60s, the Davis School District needed space to build an equipment shed and the most obvious choice was the largely unused fairgrounds next to Davis High. The land was sold to the school district in 1964 with an agreement to have one last fair on the site in 1965. A county-owned park in an unincorporated area between Kaysville and Farmington was a decent place for relocating the county fair, but the required buildings and improvements could have taken years to complete. Meanwhile, Lagoon had been thriving since its World War II closure and it already had a race track and several practical buildings for exhibitions and contests. The former home of so many earlier county fairs was starting to look like an attractive venue once again. A deal was settled upon in 1965 for the fair to come back to Lagoon.¹ New animal sheds, pavilions and a grandstand were constructed on the property. The race track was revitalized after decades of going unused. The return of the county fair to Lagoon in 1966 brought in record crowds estimated to be three times the size the attendance of any previous fair. The tradition continued each August with the fairgrounds also being used for events like Boy Scout jamborees. In the early ’80s, another multi-year lease was about to run out and Davis County was looking for a new site for its fair once again. In 1981, Lagoon began maintaining the county-owned grandstand (which stood where Double Thunder Raceway is now) as part of an agreement to purchase them from the county at the end of the lease. But the following winter, Lagoon showed interest in becoming a permanent host for the fair and even talked about donating land north of the park to the county for that purpose. Davis County had $50,000 budgeted for buying land for a new fairground and if it was decided to stay at Lagoon, that money would have gone towards construction of new buildings. The county also looked into the possibility of allowing the grounds to be used by equestrian groups to generate more revenue year-round. A deal was never reached and the Davis County Fair had its last year at Lagoon in 1984. Livestock pens used since the ’60s were sold off and removed by early June of that year. 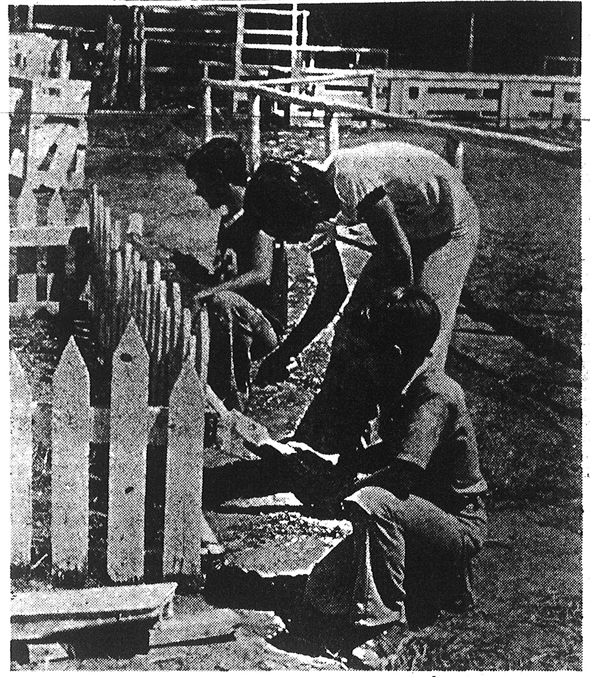 Temporary pens were set up for the 1984 fair and afterwards, Lagoon went ahead with projects utilizing land once set aside for the fair. In September, construction began on a new maintenance and warehouse building where the pens had been located. A Deseret News interview with Peter Freed in 1982 revealed, “…Lagoon soon will expand to the north, building rides where the Davis County Fairgrounds now stand and the rodeos are held. He [Peter Freed] expects one of the first rides to be a new roller coaster, which he said he expects will cost about $3 million.” It’s very likely that the coaster mentioned was Colossus: The Fire Dragon which cost about the same and was installed the following year on the south end of the park. It wasn’t until 1986 that Lagoon’s midway expanded northward onto part of the land occupied by the race track. There were even plans to build an IMAX theater² somewhere on Lagoon’s property which never came to be. The Davis County Fair would return to Kaysville for a time before a new, permanent fairground was completed southwest of Lagoon and Interstate 15 in 1990. 2. Read more about the Lagoon IMAX which was never built. Public Opinion. Davis County Clipper, 17 Jun 1892. Kaysville Kinks. Davis County Clipper, 23 Mar 1906. Will Hold A County Fair. Davis County Clipper, 29 Jun 1906. Excellent County Fair. Davis County Clipper, 5 Oct 1906. Proved A Big Event Farm Bureau Day. 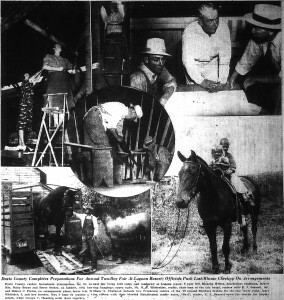 Davis County Clipper, 3 Sep 1926. Food Cookery Exhibits Feature Davis County Fair At Resort. Deseret News, 26 Aug 1931. Farm Bureau Sets Davis County Fair At Lagoon, Aug. 15. Deseret News, 26 Jun 1934. Davis County Fair Opens At Lagoon; Exhibits Colorful. Deseret News, 24 Aug 1939. Davis County Fair Sets All-Time Attendance Record. Deseret News, 26 Aug 1939. “Davis Howdy Days” Announced as New Davis Fair Name. Davis County Clipper, 7 Jun 1940. County Fair Cut To One Day To Aid Victory. Davis County Clipper, 10 Jul 1942. Davis County Fair Opens at Kaysville. Deseret News, 25 Aug 1950. Davis Too Considers Fair Site At Lagoon. Davis County Clipper, 4 Sep 1964. A Fair Question- Where To Locate. Davis County Clipper, 19 Mar 1965. County Fair, Lagoon Ready For Signature. Davis County Clipper, 28 May 1965. County Fair Is A Success. Davis County Clipper, 2 Sep 1966. Davis County’s Fair Aug. 17-19 At Lagoon. Deseret News, 6 Jul 1972. Fair time in Davis. Deseret News, 23 Aug 1973. Davis Signs Contract For Fairs At Lagoon. Davis County Clipper, 3 Jan 1975. Davis celebrates with parade. Deseret News, 21 Aug 1976. Lagoon to purchase fair-site bleachers. Deseret News, 12 Feb 1981. Lagoon possible fair site again. Deseret News, 26 Jan 1982. Davis County Fair expected to pack Lagoon. Deseret News, 4 Aug 1982. Pearson, Howard. He’s the master of the midway. Deseret News, 6 Aug 1982. County unlikely to buy new fair site soon. Deseret News, 7 Sep 1982. Lagoon stock pens are being removed. Deseret News, 31 May 1984. Winter hasn’t slowed the work at Lagoon. Deseret News, 5-6 Feb 1985. Arave, Lynn. 4 days of fun on tap at Davis fair. Deseret News, 16 Aug 1999. History of the Fair. UtahStateFair.com, accessed 2 Sep 2012.